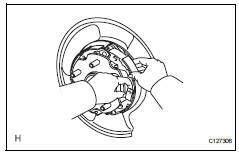 Remove the shoe adjusting hole plug from the rear disc. Put matchmarks on the disc and axle hub. Turn the shoe adjuster until the disc turns freely, and then remove the disc. Install the shoe adjusting hole plug to the disc. Using needle-nose pliers, remove the 2 shoe return tension springs. Using needle-nose pliers, remove the tension spring. Press the shoe hold-down spring to remove the pin, shoe hold-down spring and shoe. Slide the shoe to remove the shoe hold-down spring, pin and shoe. 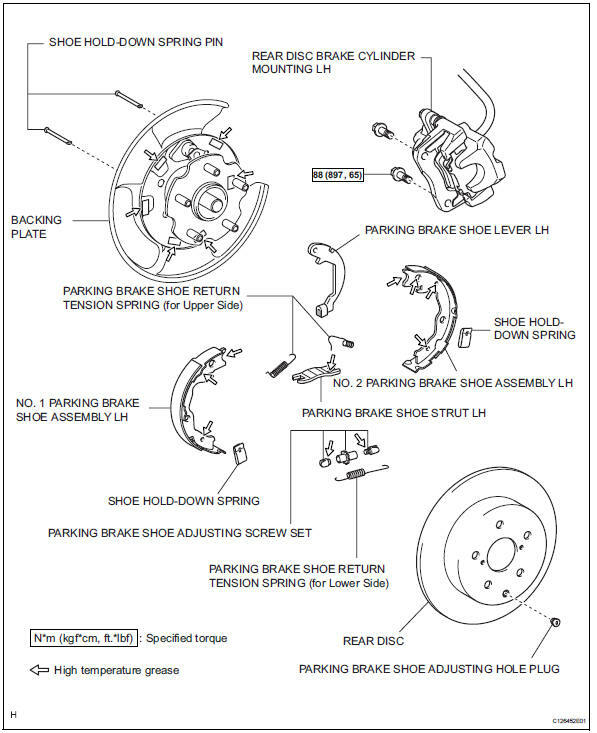 Disconnect the parking brake cable from the parking brake shoe lever. 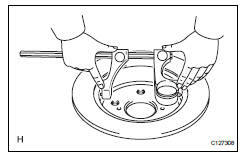 Using a drum gauge or equivalent, measure the inside diameter of the disc. 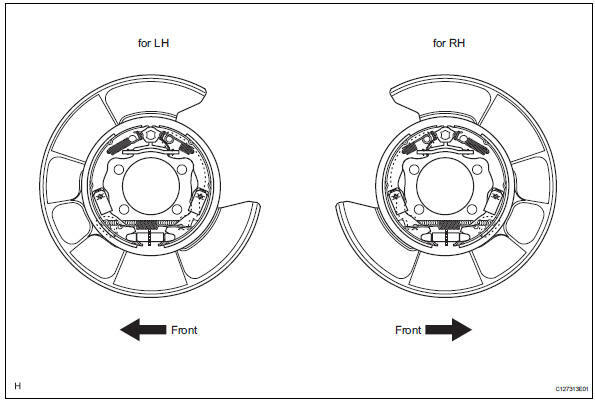 If the inside diameter is greater than the maximum, replace the disc. Using a ruler, measure the shoe lining thickness. If the shoe lining thickness is equal to or less than the minimum, replace the brake shoe assembly. Apply chalk to the inside surface of the disc. 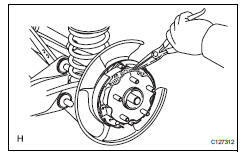 Touch the brake shoe to the disc and check that there is full contact between the brake shoe and disc (white chalk is transferred to the entire brake shoe). If the contact is not as specified, use a shoe grinder to repair the brake shoe, or replace the brake shoe assembly. 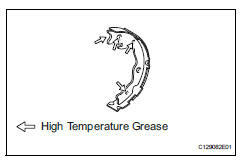 Apply high temperature grease to the contact surface of the shoe and backing plate. 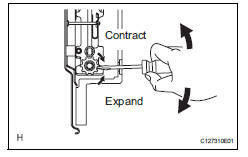 Connect the parking brake cable to the parking brake shoe lever. 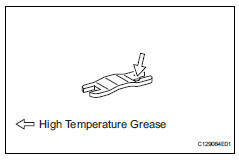 Apply high temperature grease to the following contact surfaces of the shoe. Install the shoe with the shoe hold-down spring and pin. 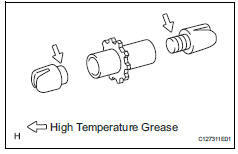 Apply high temperature grease to the adjusting bolt. Using needle-nose pliers, install the tension spring. 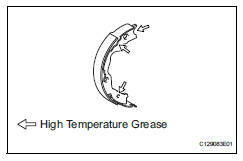 Apply high temperature grease to the contact surface of the strut and shoe return tension spring. Using needle-nose pliers, install the 2 shoe return tension springs. check that each part is installed properly. There should be no oil or grease adhering to the friction surface of the shoe lining and disc. 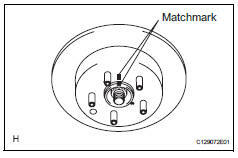 Align the matchmarks and install the disc. 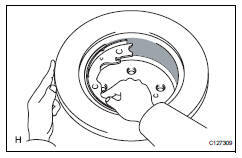 When replacing the disc with new one, select the installation position where the disc has the minimum runout. Temporarily install the hub nuts. Remove the shoe adjusting hole plug, and then turn the adjuster to expand the shoe adjuster until the disc locks. Check that the shoe has no brake drag. 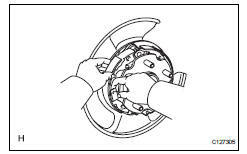 Install the shoe adjusting hole plug to the rear disc. Pull the parking brake lever with a force of 147 n (15 kgf, 33 lbf). Drive the vehicle at approximately 50 km/h (31 mph) for approximately 400 m (0.25 Miles). Drive the vehicle on a safe, level and dry road. Repeat the above steps 2 or 3 times.